The last couple of weeks I again hardly played any poker. Sometimes it feels like I have to move on and fully focus on my career, on the other hand the poker player is still in me, I just can’t find the motivation and time to grind next to my other activities. Work is soaking up most of the time, the current project I’m working on is really interesting and fun and I don’t mind to work a little extra. Cycling is going great, I’m just back from France but I’ll tell the rest of the story another time. I also played a lot of Diablo 3, after work I just love to do some mindless clicking and D3 is the perfect game for me to release some tension. Before I left for France I played D3 every day, I didn’t have any time after my trip until last Saturday. I fired up the game but after 5 minutes I didn’t feel like playing anymore, it seems that I’m done with the game and often that means it’s time to move on (or move back). I was watching EPT Barcelona because Fatima Moreira de Melo was doing great (16th in the end) but also because Pokernews.nl reintroduced video recaps and boy did I miss that (welcome back Scriptdude and also well done Frank op de Woerd ofc). I felt eager to play some poker and I was happy to get back to the online tables for a small Sunday MTT grind. I started with the Sunday Warm-up and the last MTT which I regged was the Sunday Million, 8 MTTs in total. I tried to play tight, don’t do anything stupid and see how far it will take me. I busted some of the smaller tournaments pretty quick, couldn’t lay down AJo on KK9A9 vs the Big Blind in the Sunday Warm-up for almost all my stack and at 20:25 I almost unregged the Sunday Million since I was doing pretty poor. After that I mainly waited for hands, often won the blinds and was ahead almost all the time except for some standard coinflips. Looking back I don’t really see a lot of hands in which I really had a decision to make, I doubled up with TT vs 88 to get a decent stack and with roughly 150 left I didn’t get a lot of playable hands except for KK and QQ once but could only pick up the blinds. I was 27/46, floated most of the time somewhere between 12 and 20 blinds and got some help when I opened with KQs from UTG, the chipleader called in the BB and shoved with K3o on Q73 after my c-bet. 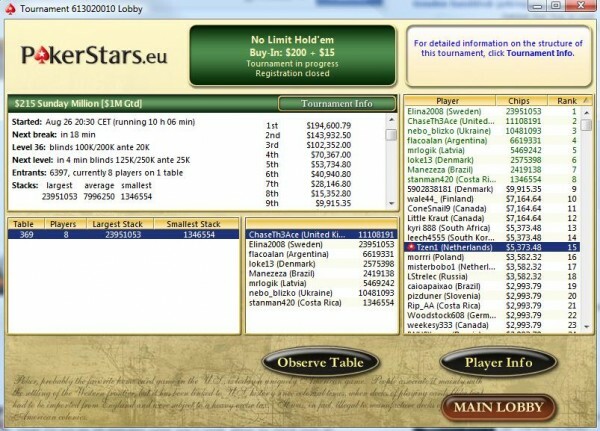 1.7M in chips, the most I ever had in the Sunday Million for sure and after a long absence I was in the top10 again. It was the last hand that I got to showdown with, from there on I only shoved or re-shoved and never got any callers. I only (re-)shoved with good hands like AK or TT, I didn’t pull any “crazy moves” so would have been fine if I got a caller but winning without showdown is of course an even saver way to stay in a tournament. 9th with 21 left and I was pretty nervous. I’m not a great MTT player and didn’t play any proper poker the last weeks, I grabbed a standard Push/Fold chart for some help. A standard Push/Fold chart isn’t perfect but it is probably more close then figuring out what to do on the spot for a Limit player like me. I didn’t get any spots in which I really needed to use it and we got down to two tables, I couldn’t wait to wake up my best buddy telling him I was at the Final Table of the Sunday Million. I had around 2.5M in chips and a lot of people were floating around that size with blinds being 65.000/130.000. Some antes and blinds later some had bust, some took the blinds or doubled up and I shoved 33 from the cut-off to keep my stack a little above 2M. Blinds went up to 80.000/160.000 and with 1.8m left I got J8o on the button, I checked my Push/Fold chart saw it was a shove and didn’t think about it. I got called by ATo, closed my eyes and heard the checkbox popping up telling I busted in 15th. It’s never fun to bust a tourney, especially not so deep. After a minute or so I wondered why I shoved J8o after playing so tight all the time? I told myself to stick to the sheet, looked at the sheet one more time and saw I had to wrong page in front of me. It was the range when having only 4 or 6 BB left, it made sense pretty quick, J8o was way to light and I could have known it but I just didn’t think. I instantly got pretty pissed at myself. I don’t regret my decision to base my play on a Push/Fold chart since I’m just not an expert in MTTs, was tired and nervous but I do regret the poor execution of that decision. I can only blame myself which I also do at this moment, how often do you get this far (especially someone like me who hardly plays MTTs). Busting with AA vs KTo wouldn’t have been more fun but at least I wouldn’t have regret my own play. The $5.373 is nice but it’s not even close to the $194.600 which was up for grabs for the winner. “I never really know what to do with so many blinds so probably pulled some stupid moves” <— you only had 30 bb's? This was an example with less blinds but earlier I had more blinds and made 2 bad moves as well, luckily I was table chipleader so couldn’t bust myself. I just read your post and the way you described it sounds very familiar to me. Don’t feel bad about your decision, I made a simliar mistake in the old $1m guaranteed on full tilt with 20 players left by shoving K3o in cutoff with 20BB left after getting beat with KK vs AQ on the river the previous hand. Zuur van het mis-readen van je tabel. A healthy hangover Almost 30!